What a good week in reading! May have forgone some chores, but almost done with the reading and posting for December!! You had a great reading week, I see you have started on Christmas reading! A great reading week. Hope you like The Round House as much as I did. I hope you enjoy Twilight! I didn't care for it that much, but some people absolutely love the series. 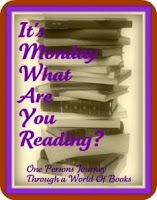 Take a look at what I'm reading this week. You had a busy week! Hope you enjoy the upcoming holidays! I'm reading a book for my new job as a writing consultant at the university I attend - it's about how to be a tutor and techniques to get the most out of a tutoring session. After that, I'm not sure. I'm bored with books lately. I start something, but then I lose interest after just a few pages.